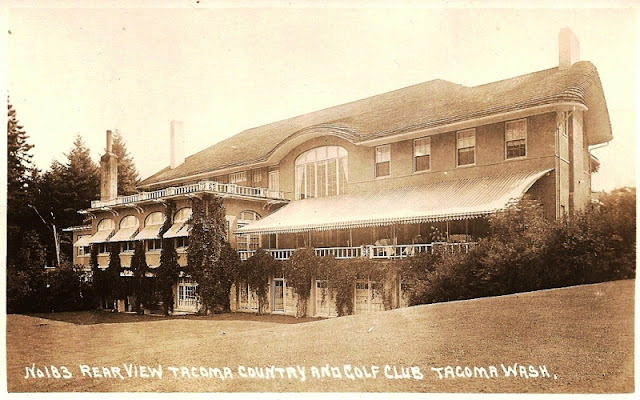 When the grand old lady (Clubhouse 1910-1961) was taken by fire, so much was lost. Only a handful of artifacts and documents were spared from destruction. That means almost every historical relic from the Club's first 60+ years of existence is gone. For this reason I get so excited when I find something significant from this period of the Club's history. I have found some very interesting things and I've shared some of those things with you here on the blog. Go to the right hand column of the blog and click on "history" if you want to see some of the things I've found. Today I want to share with you my latest, and perhaps greatest find to date. Check out this trophy that I just won in an auction on e-bay. So yes this is a trophy presented to J. Gillison Jr. presumably when he won the Men's Club Championship in 1910. Some of you might be saying "what about the Balfour Medal"? Everyone knows that the Club Champion gets his name inscribed on the Balfour medal. This is true but remember the Balfour Medal was misplaced for almost 30 years and some say it was lost in the first clubhouse fire in 1909. Click HERE for more info on the Balfour Medal. We don't know for sure when and how the medal was lost exactly but clearly in the absence of the medal, it appears the Club awarded this trophy at least for the year of 1910. What did the Club do for the Champion in 1911 and each year following until the Balfour Medal was recovered in 1938? It's uncertain but I'll keep looking for those answers. I just love digging through the internet looking for answers to those types of questions. Something I found the other day kind of came by accident and it is really interesting. To explain I have to backtrack a couple of years when I found an old box of stuff at the maintenance facility. This box of stuff had lots of interesting artifacts that were kind of random and really didn't seem to come from the same time period. The oldest things were from the 60's, but there was one blueprint of the golf course which was clearly older......much older. Here's a picture of it. If you would like to download it so you can look at it closely click HERE. You will notice some very interesting things which tells you that it's very old. First of all apparently there was a large polo field east of the railroad tracks. I have not seen that on any other map of the area. Also, you can see that the entry road comes in and cuts right through the old 10th and 11th holes. I wonder how much the crossing horses and buggies interfered with the pace of play? Along the east property line there is no Pacific Highway. I have never seen a map of the area which did not show that there was a major road along the tracks. This map says there is a county road along that path but it is on the Club's side of the tracks which means that is our service road today. So anyway when I found this map I knew it was probably the oldest map of the property that I've ever seen. 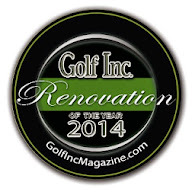 The most interesting thing to me about the document is how the golf course is routed unlike any way I've ever seen. For instance look at the first 4 holes. Hole number 1 (which is of course is today's 10th) looks to be the same but then holes 2, 3 and 4 are completely different. It looks like 3 consecutive par 3's. This seemed plausible but I had never seen any evidence anywhere that supported the idea. 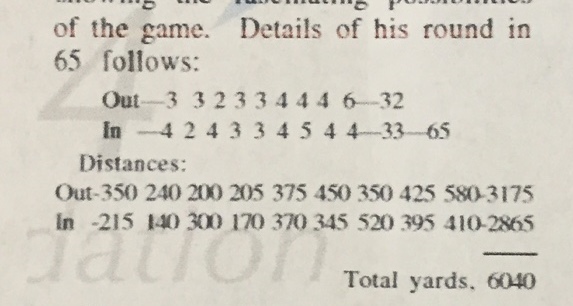 The oldest scorecard that I know of is from 1921 and it supports the routing which we know existed up until 1989 when the course was altered to add 3 new holes and make the two finishing holes into our practice range. Without any supporting evidence I pretty much had to concede that the routing on this map never existed. For all I knew, this map was just a plan that was never executed. All I could do was scan the map to preserve it digitally and pack it away in the box where I found it. Well now all that's changed. Today, I know that routing did exist. Let me explain. In my spare time I frequently will dig through old newspapers on the internet looking at anything related to the Club (yes I'm a total golf history geek). I have found so many interesting clippings that I now post them in the restrooms on the golf course above the urinals. That may be weird but I saw this done in Ireland at the Island Club and thought it was a neat idea. I made these cork boards and I try and change the clippings every couple weeks. The other day I was posting this interesting clipping from 1911 which talked about Jim Barnes shooting some impressive scores and it mentions the distances of the holes on the way out and then on the way in. I looked closely at the distances and sure enough, they match the routing of the course on the old map. Look for yourself, here is a close up of that section of the article. Notice hole 2,3, and 4 are all longish par 3's. Also check out the ninth hole which is today's 18th. It's a monster at 580 yards. Is it possible that that hole was a par 6? We might never know the par of these unfamiliar holes but still this confirms the old routing and I think that's a major discovery. Just for fun I measured all the holes on the old map and then I drew them in scale on a map of the golf course today so you can see where these old holes were. 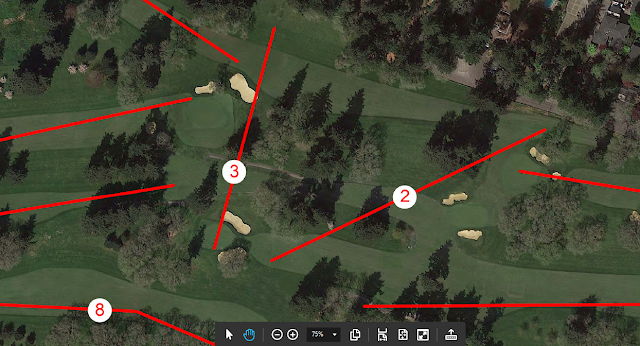 For example, using the scale, the first hole measured at 376 yards and the tee was about where the posting computer is in the proshop today. In the 1911 newspaper clipping, the first hole measured at 350 yards so I assume at that time the hole had been shortened to accommodate a caddy house or proshop which means the old map pre-dates 1911. That is an assumption and I can't be sure but maybe someday I'll uncover something else that can help us make that determination. Anyway, the old map was created by an engineer so it's very likely that the scale is accurate and we can assume that at some time the golf course was laid out exactly as the map shows. If you click HERE, you can look at or download a map of the old routing laid out on top of today's routing. Here's an example of what that looks like in the center of the course. Also, look in the bottom left and you'll see I inserted the yardages for the old routing as measured on the map. 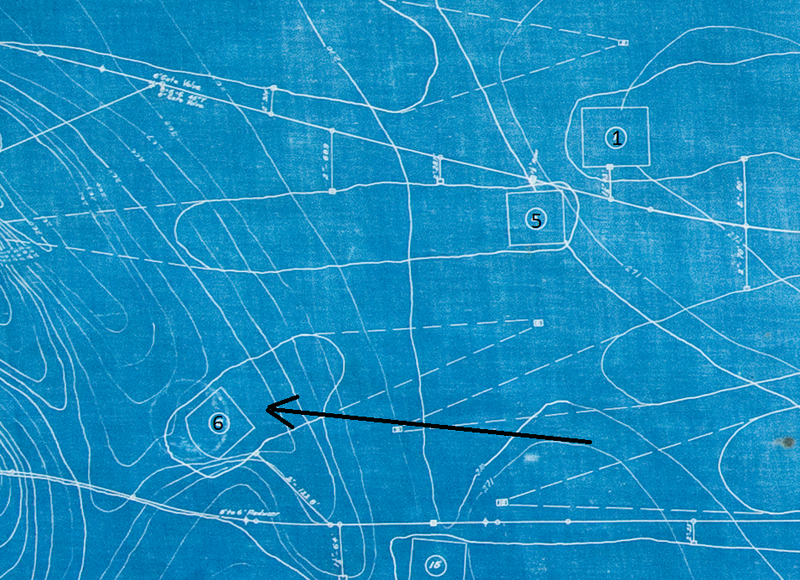 Coincidentally, the discovery of this old course answers another question I've always had about the 6th hole. Remember #6 green used to be off to the left of where it is today and in this old picture of the 1923 irrigation as-built you can see that the front edge of the green is at an angle facing the tee near the first green. I always wondered why the green was tilted at an angle to the tee and now I know. 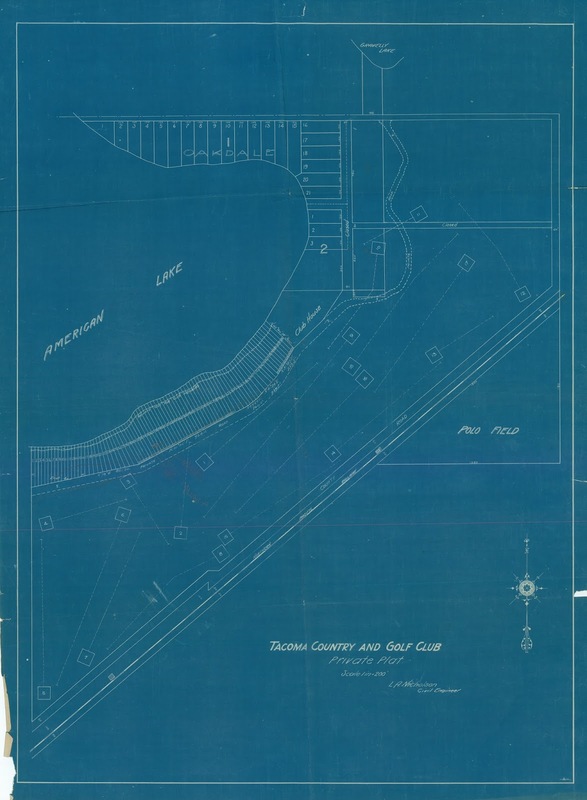 So in other words, the 1923 irrigation as-built also confirms that the old course did exist and that that is the course on which Jim Barnes played. 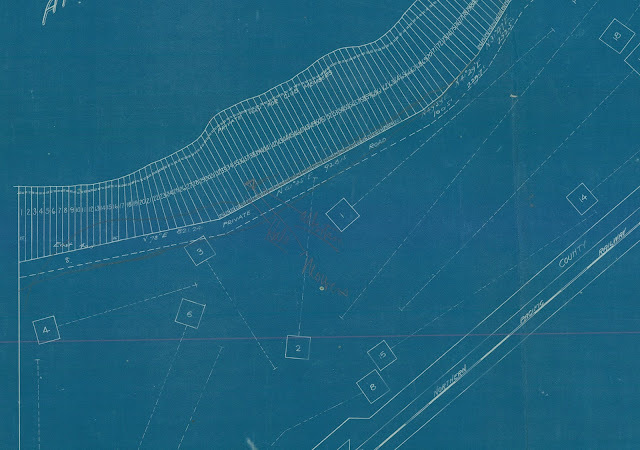 If you want to download and look at the 1923 irrigation as-built click HERE.